Book Computers Ads in Indian Newspapers Instantly Online! Why Book Computers Ad in Newspapers? Computers Ads are mainly published for Official purposes by most advertisers across India. These ads are essentially released by individual advertisers as an official notification and documentation of the change in their identity. Newspapers have always been the only choice for any Computers necessary for any official purpose. Text Ads, though simple to compose, should be to-the-point and brief, especially for a Category such as Computers. Display Classified ads, though not common with Computers ads, are still frequently opted for by advertisers. These ads are a type of classified ad which enables you to upload images and logos as per your requirement. Often Computers advertisers intend to put up their own image in their ad matter. Classified Display Ads are ideal for such purposes. Classified Display Ads can be creative or highlighted; you can choose any of the options for your Ad. 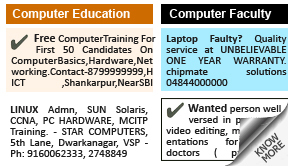 How to Book Computers Advertisement In Newspapers? releaseMyAd has always aimed at simplifying Newspaper Advertising for all our privileged existing and future clients. So to begin the booking of your advertisement, you first need to visit releaseMyAd.com, then you need to choose the ad type as Display Classified and proceed to choose the category as Computers. 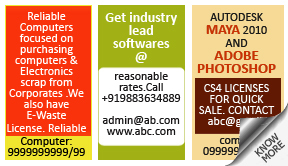 After which you can review the rates in per sq.cm unit and then create your ad with the help of online design templates. You can also upload your own advertisement in the Compose Ad section, specify the ad size to avoid any hassles while booking the ad. As you are done with creating your advertisement, you must mention or choose the preferred release dates, review the exact cost of your advertisement in the Preview Your Booking Details section. Then you can choose the preferred payment mode as per your convenience, which include both online and offline payment options. You can choose to pay via Credit/Debit Card, Net Banking, Cash/Cheque Deposit, NEFT (Online Cash Transfer) and Cash Collection. For more details and answers on booking Computers Ads in any Newspaper, visit the Computers FAQ Section. Q. What is the best newspaper to advertise for website designing services in west Delhi? Q. I want to know the rates for major newspapers in the city like TOI,HT,the Hindu and Economic Times in all categories. This is regarding the promotions of a website regarding Executive Education. Please help with all relevant information. Q. We are a matrimonial website, wanted to know how to book the display advertisement and what are the rates for the same for The Indian Express, Gujarat edition.